It’s a no brainer, but in the playoffs so far six of the eight series are being won by the team who has taken the fewest penalties. That doesn’t necessarily mean they’ve taken more punishment, though. The Caps have seen the worst of it, they’ve absorbed the second-most hits of any team in these playoffs and to make matters worse they’ve taken far more trips to the box than the bashing Bruins. The Bruins have outhit the Caps by a margin of 134 to 106, and have taken the third fewest penalties of any playoff team. Their ability to take the body and avoid taking penalties is part of it, and to make matters worse their crashing and banging has frustrated the Capitals into taking some penalties of their own. The Bruins have been so disciplined they’ve allowed the Capitals the fewest power plays of any team in the post-season. While much of the focus has shifted to the gruesome series between Philadelphia and Pittsburgh in what’s being talked about as one of the bloodiest playoff rounds yet, there have been more hits (and far fewer penalties) between Boston and Washington. In fact, the two hardest-hitting series have been the least penalized: the Devils and Panthers have had 208 hits with both teams averaging only eight penalty minutes per game, and the Bruins and Caps are behind them with both the second-most hits and the second-fewest penalties. These series, far more than the higher-profile violence in the Flyers/Pens and Rangers/Sens, have proven that hitting is not out of the game. More importantly, it demonstrates that a hit doesn’t mean an automatic trip to the box or to The Shanahammer Lounge. The exception is the Capitals first serious misbehaviour with Nicklas Backstrom giving Rich Peverley a taste of his stick in a cross check to the mouth after the buzzer on Monday night. Prior to the incident it was becoming clear the Bruins had gotten under Backstrom’s skin, as the center had already amassed two previous trips to the box. On Tuesday, Brendon Shanahan handed Backstrom a one-game suspension that will cause him to miss Game Four in Washington. Backstom has been the Capitals most penalized player having taken 16 penalty minutes, nearly half of the team’s total. The suspension was just one of eight to be handed out in the playoffs so far, which is four times as many as there were in the entire month of February. 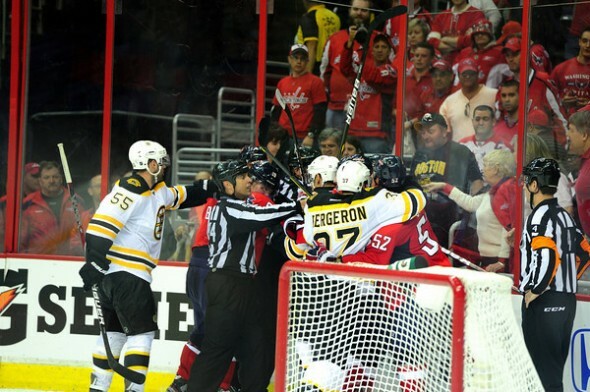 The suspension of Backstrom and the numerous penalties and power plays the Capitals have taken reveals the Bruins as a team that is able to antagonize their way to victory, instigating Backstrom to the point that he took himself out of a must-win Game Four for the Capitals. This is a huge blow to Washington’s playoff push. Backstrom was pivotal in Game Two, getting the game-winning goal in overtime. The Caps will have to find a way to not be driven to frustration by the hard-hitting Bruins. On paper, Washington is one of the league’s biggest teams, weighing in as the heaviest and fifth-tallest group. On average, they even tower over the Bruins, who have Zdeno Chara skewing their stats. The Caps have potential to utilize these big bodies, and were able to in the regular season outhitting the Bruins by 194 hits over the course of the season. But it’s last year’s Cup champs who are proving they have the ability to out-grind, out-frustrate and out-discipline their opponents.